This interview was done at New York Comic Con 2018. We caught up with Michael Witwer, Kyle Newman, and Jon Peterson to discuss their upcoming book Dungeons and Dragons and Art and Arcana, the process behind the book, and of course, the history of D&D. Keith Rice: Okay, so you guys are promoting Dungeons and Dragons and Art and Arcana. What can you tell us about it? Michael? 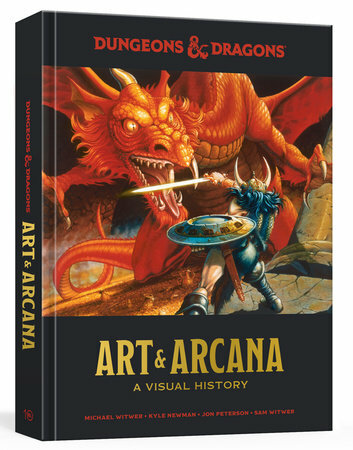 Michael Witwer: So, Art and Arcana is a complete, comprehensive visual history of the Dungeons and Dragons brand. Not just art, but also advertising, ephemera, and all kinds of other imagery that really tells the visual history of the story from beginning to end. KR: How’d the idea come about? Kyle Newman: The idea came about because I was back in Dungeons and Dragons, started playing 5th edition, and was ravenous for more material. I said where is the book? What have I been missing for the past 10 or 12 years. Where’s the art book? Where’s the history book? And there wasn’t one. So, I was like, I’ll make the book. How am I going to make the book? And I reached out to Michael, I was a fan of Empire of imagination. And I knew his brother Sam [Witwer] and Michael and I had known each other peripherally on Facebook. I said, would you be interested in doing this? And he was like, “Absolutely and my friend Jon would be great too, Jon’s a D&D historian.” So, we started to assemble this group, and Sam was like, “You’re making a book with my brother and I’m not involved? And I fricking love Dungeons and Dragons, too.” And I was like, “Well of course, man if you have time, let’s all do this together.” He was so passionate, so resourceful. We just formed like, a super-team, and all brought different expertise to it. I saw the idea of the book, but didn’t know exactly what it was going to be. Is it going to be more history, more art? What’s the balance between image and word? Are we going to use native art, are we going to show product covers? We had to strike that happy medium and curate something special. So, it wasn’t just the most beautiful-looking art, but it was the most important art. Not only what came out of our discussion organically and figuring out what the book was going to be. So, I would say that’s how it came about and then from there once we solidified our idea, we met in Los Angeles, we put a lot of images up on a screen, we went through them, we discussed the merits of each thing, and we stared to formulate the spine of what it would be. And then there was the archaeological stuff, which I think Jon can speak to, like, the actually the hunting down of things. KR: Well, actually my next question goes into that. So, you guys had unprecedented access to the archives at Wizards of the Coast, right? What was that like? Jon Peterson: I mean, it was fantastic. I can’t say enough about how generous the Wizards team was to us with their time. So, there’s this original company TSR that was bought by Wizards of the Coast. Unfortunately before that acquisition, though, things ended up scattered to the nine winds, because nobody really knew that they would turn out to be collectible. Now in a few cases, things that got, like, lost in a warehouse for decades eventually turned up. The cover of the original basic set, for instance, which is something that Wizards did still have, because somebody found it basically behind a box on some loading deck and fortunately some of their people recognized what it was. But, for a lot for that stuff from the early days, the 70’s, nobody knew this would be important. Fortunately, I’ve worked with a collecting community, I’m a collector of D&D memorabilia. We knew a lot of the right people to go to to find both pristine product, but also the people who owned a lot of the original art. And for some of it, it’s just a process. It just goes on and on, you turn over rocks and you hear a rumor that this exists, and maybe this person has it, and you do outreach and at the last minute it all just came together. KR: Jon, what was the oddest thing you found pulling this all together? JP: The oddest thing that we found pulling this together, hmm? KR: If you had to pick one. MW: That’s a good question. KN: Artistically or informationally? KR: Either/or. JP: So probably the one that we have to single out for this is the original Tomb of Horrors, this 1975 adventure. Now, everyone knows this famous module, this deathtrap module that came out in 1978 that’s called The Tomb of Horrors. It’s the place you go for characters that you want to die. You know, you don’t want to play them anymore. It’s full of arbitrary traps, poison gas, pits, spikes, monsters that come in droves, you stick your hand in the devil’s mouth and it gets disintegrated. It’s a terrible thing. But one of the fascinating things about Tomb of Horrors is that it started as a tournament. And the reason it was so lethal is because they were trying to find a winner, right? And back in 1975, at Origins One, they ran this tournament called The Tomb of Horrors. What we found, and what we have actually reproduced in full facsimile, for this special edition of Art and Arcana is that tournament version from 1975, with a hand drawn map by Gary Gygax with all the original descriptions, that’s something that would really blow peoples’ minds. KR: Anyone want to add anything? MW: Yeah, I’ve got one for you. So, when it comes to some of the original art, again, as Jon kind of intimated, a lot of this early stuff is homebrew stuff. They didn’t realize they were making history when they were developing it, right? A lot of times if you would draft material that you rejected for the original box set of Dungeons and Dragons, you’d probably throw it out. So, it’s a miracle that some of this stuff survived. And we were actually lucky enough to gather a few draft pieces that never made the final cut. We had a witch made by Cookie Corre which didn’t make the final cut, and we have this really peculiar piece called the Big Eye. Kyle had mentioned the idea of rumored pieces that may or may not have existed. Well, Jon and I had both heard independently that there was once a something akin to a ground beholder, as it was described to us, that Greg Bell had done. Greg Bell, being one of the original artists, he was just a teenager when this was all happening. He was asked by Gary [Gygax] to do something that was similar to what we would define as a ground beholder, a beholder connected to the ground. Well we had looked up and down and sideways and we had never come across anything that looked like this. Well sure enough at the eleventh hour we found an art collector that had a tremendous trove of art and within this trove – and by the way, John and I had both interviewed Greg Bell individually and he didn’t have any recollection of such a thing – and yet, at the eleventh hour we get this piece that is in fact a ground beholder by Greg Bell with Gary’s handwritten annotation that says “don’t use”, and “no”. We were able to reproduce that for the book. So, to say that’s peculiar? Absolutely. Unique? Absolutely. KR: Kyle, do you have anything? KN: I honestly think the seeing the five probably most important pieces – the Monster Manual, the Dungeon Master Guide, the Fiend Folio, etc. Seeing all those books in their native form, that art, and being able to put them in this was great. I love seeing that all together. I think it’s really important. I think fans are going to get a kick out of seeing it without all the logos and everything in its native artist form. KR: All right one last question to wrap things up. Favorite class? MW: Bard. JP: Magic User. KR: Kyle? KN: I got to go with Wizard, but I’m loving Clerics, too. Check out Dungeons and Dragons and Art and Arcana! 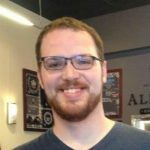 Keith Rice is a West Virginia native and a freelance writer residing in Philadelphia with his lovely, if oft exasperated wife and three cats. Keith fosters an enthusiastic appreciation for beer and scotch, collects comics, and most importantly is an avid reader and movie lover. Oh, he’s a pretty big fan of sci-fi and fantasy as well. Drop him a line @Keith_Rice1.